Tyler Perry and his Madea films look like a bit of a paradox: they’re reliably profitable and popular amongst his fans, despite all of them being met with a universally negative critical onslaught. I personally wouldn’t know what they’re like because they don’t bother to release Tyler Perry movies internationally. From my London perch, I’ve so far lived a Madea-free life and thus have absolutely no idea what she does or even is. Still, it’s come to my attention that Boo 2! A Madea Halloween is now a thing – because people were desperately calling for a sequel, right? – and will be making its way into theatres later this year. According to Perry, the film will find Madea, Bam and Hattie, whoever they are, journeying to a haunted campground where they must run for the lives when “monsters, goblins, and the bogeyman are unleashed.” Sounds terrifying! 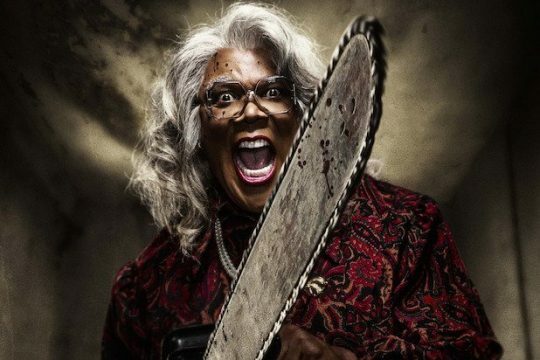 The setting is obviously a fertile ground for terror, carrying with it the weight of classics like Friday the 13th, and I’m sure Madea will be drawing from that and other wells of inspiration pretty frequently. Perhaps it’ll develop the plot of its predecessor, Boo! A Madea Halloween, in which Madea crashes a Halloween house party. According to Wikipedia, the hosts of the party become annoyed with her presence and decide to play some pranks on her. This leaves the character running for her life from all manner of ghosts, ghouls and zombies. Given that it’s sitting pretty at 21% on the Tomatometer and multiple critics are accusing Perry of “phoning it in,” I’m going to assume this isn’t one to rush out and catch up on. Not that I could anyway, because out here in the rest of the world, we literally have no idea who Madea or Tyler Perry are. Whatever kind of film Boo 2! A Madea Halloween turns out to be, it’ll arrive in theatres on October 20th.